WOOSTER, OHIO–We were greatly honored this evening to have one of our own, Dr. George Davis (Wooster ’64), present the 31st Annual Richard G. Osgood, Jr., Memorial Lecture. The Osgood Lectureship was endowed in 1981 by the three sons of Dr. Osgood in memory of their father, who was an internationally known paleontologist at Wooster from 1967 to 1981. We have had extraordinary experiences with visiting speakers through this lectureship, and tonight’s was one of the best. 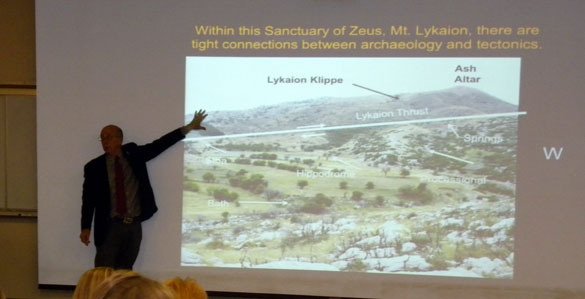 Dr. Davis gave a public talk entitled “An evening’s geoarchaeological excursion to the Sanctuary of Zeus, Mt. Lykaion, The Peloponessos, Greece”. He described his stratigraphic and structural geological work in this fascinating region, which may have hosted the origins of the Zeus cult. It was (and still is) a thriving sports complex as well. Dr. Davis did interdisciplinary work as a geologist with his Brunton compass and as an archaeologist with a trowel — both iconic instruments of the professions. 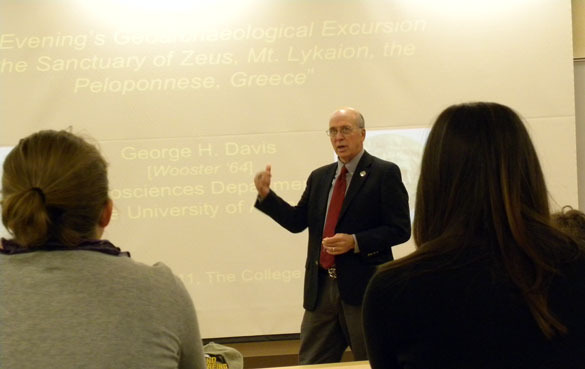 Dr. Davis is a highly accomplished geologist with an outstanding reputation in teaching and research. After Wooster he earned a Master’s degree from the University of Texas at Austin, and then a PhD at Michigan. As a professor and chair at the University of Arizona for many years, he helped make that department into one of the best in the country. Dr. Davis has worked around the world and is best known for his analyses of geological structures in the Colorado Plateau and Basin & Range provinces. He is the author of a best-selling textbook in structural geology and has received many awards and honors. In July of next year he will become President of the Geological Society of America. 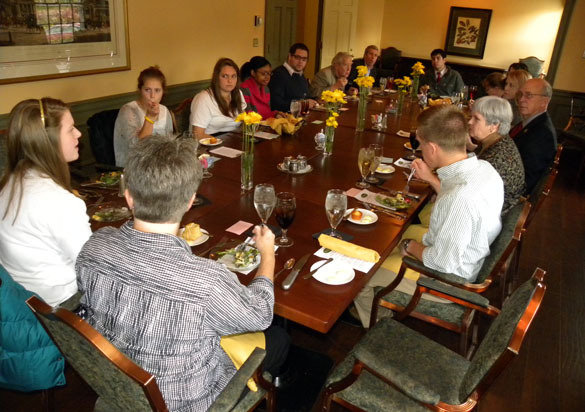 One of the joys of having our Osgood lecturer on campus is the traditional dinner with Wooster students and faculty before the talk. Dr. Davis had many geological stories to tell us, and he was a master at getting people around the table to talk about their motivations and geological dreams. A great evening was had by all!